A current exhibition at the Walker Art Center in Minneapolis, MN aims to explore visually and historically what curators Darcie Alexander and Bartholomew Ryan term as “International Pop”. Their narrative includes art created from the late 50’s into the 1970s in Latin America, Europe and Japan beyond the mainstream conception of Pop Art being American or British. Emerging from the criticism on mass culture and multiples, Pop Art has become a staple in the world of contemporary art that begs re-evaluation on a larger scale. 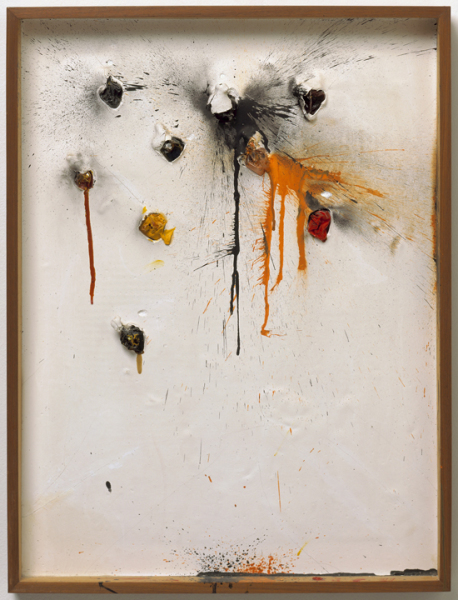 Being a prominent member of the French artist group Nouveau Réalistes (New Realists), Niki de Saint Phalle’s work Untitled from Edition MAT 64 has been included in the discussion. On this occasion, author and scholar Nicole Woods published a detailed thesis on the subject after thorough research that included a visit to the NCAF Archives last year. Besides an overview of Saint Phalle’s “shooting events” of the early 1960’s, Woods focuses on the Edition MAT as part of the concept of viewer participation, chance and multiples in the creation of art. Not much has been discussed on topic of the Edition MAT in English publications, therefore it was enlightening to see the process of creating Untitled from Edition MAT 64 by local artist Hollis MacDonald and collector Edgar Nash. Her essay is posted on the Walker Art Center website.